Remember getting into the holiday spirit singing Silent Night by candlelight at Vespers? Or going on choir tours with your closest friends? 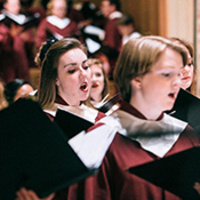 All members of Trinity’s choral program, past and present, are invited to reconnect with longtime friends, relive your choir memories, and re-energize your passion for music at the Alumni Choir Festival. Be part of Trinity’s 150th-anniversary celebration by joining in this milestone event.